The latest novels by Susan Daitch and Emily Barton both feature fictitious nations. Barton’s The Book of Esther supposes the existence of a Jewish state in Eastern Europe. Daitch’s novel, The Lost Civilization of Solucidir, follows the search for the the ruins of a fabled middle eastern city. 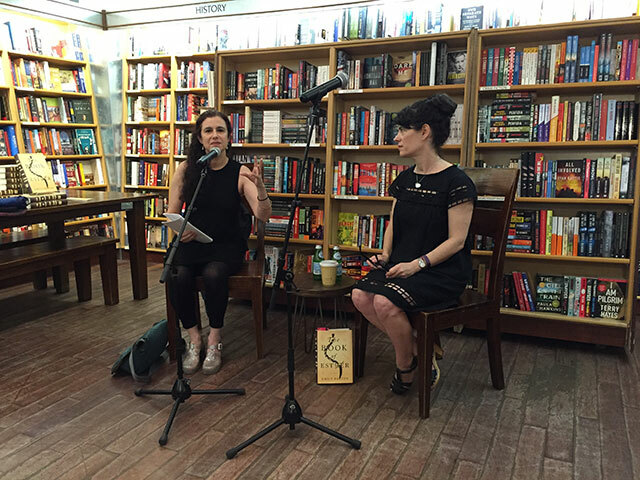 Both women were at McNally Jackson Books to discuss their novels. The Book of Esther explores the idea of Jewish refugees into Europe fleeing a war and the implications of a Jewish lead state. The novel’s protagonist sets off to be turned into a man by ancient villagers in order to save her people. The novel has drawn comparisons to Michael Chabon’s The Yiddish Policemen’s Union and Philip Roth’s The Plot Against America. The Lost Civilization of Solucidir looks at post-colonial implications of a lost city as explorers seek out the riches of its resources beginning with a graduate student in the modern era. The narrative looks back in time at the historic moments when previous attempts to find the city were made. Both books required research. For Barton, her research largely pointed in one direction and there are not too many sources. She imagined a thousand years of isolation which allowed her to invent what she needed. The main problem that arose was she had written a scene involving the scaling of mountains, but the mountains didn’t exist where she needed them. Barton says she’s in favor of imagining as much as possible and inventing as much as she can. Research is a means to an end. For Daitch, her research began by spelling ridiculous backward and coming up with the name of the lost civilization. She wanted to examine the idea of explorers seeking out a mythological place because she is interested in the idea of of people seeking out different versions of the same story. All research must eventually come to an end. The rabbit hole of research can overtake everything. One problem is that as you go along, Daitch says, you keep finding more things to write about. Research can get away from her. “I love plot,” Barton chimes in. She added a werewolf and before long the creature took on magical powers. Her characters were city people suddenly away from their city, and didn’t know what to expect. She explains that her decisions in creating the place was that she wanted to have a conversation about what it meant to have a Jewish State that wasn’t real. The what if this existed had inspired her.